By about 9 months you can encourage different types of finger foods and begin to think about prioritizing family mealtimes. We recommend allowing children to try to feed themselves and assisting as necessary. Once children are eating well on their own, then you no longer need to feed them. We want children to learn to feed themselves when they are hungry. Be available and flexible to support them if they need help scooping to the bottom, or help opening something, but try to maximize their independence. Talk about feeling hungry or full to help tune your child into their body. Typically by around 12 months, children should be eating along with adults and eating the same food as you are preparing for the rest of your family. It can be a difficult balance between supporting children to tune into their bodies’ cues for hunger and fullness and helping children to eat on a healthy schedule. Toddlers typically need a set routine for meals, they don’t do as well with on demand eating. 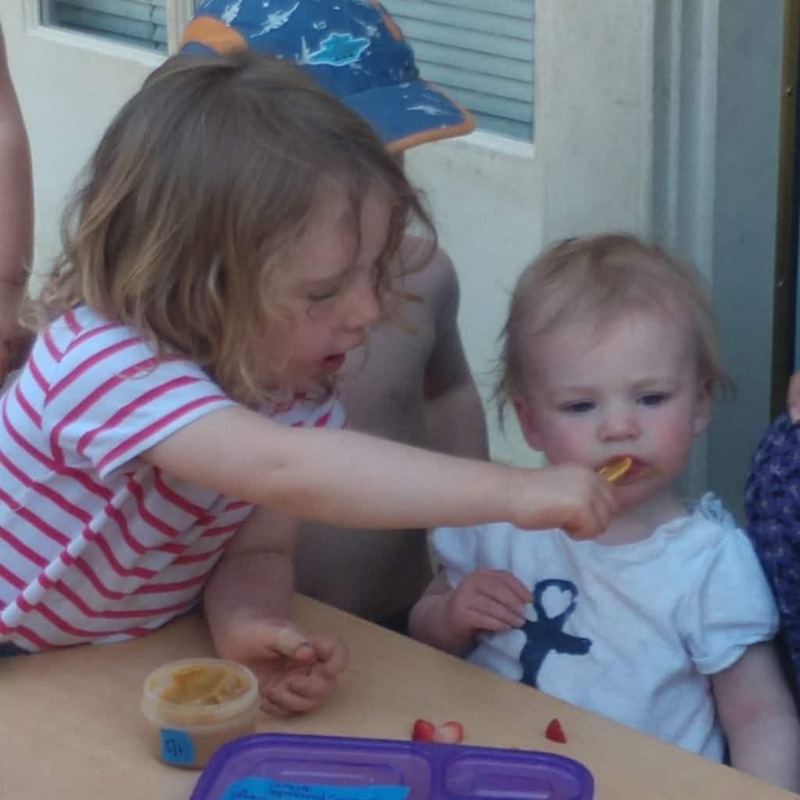 Some toddlers may sit and eat anytime the food is available and others may never eat or only graze. Toddlers benefit from a structured mealtime with a clear start and finish. With this structure we encourage you to invite children to eat during meal times and play during playtimes. We have found children who eat at meal and snack times and do not snack between meals eat better than those who graze all day. We recommend meals are set about 2 but no more than 3 hours apart. Talk with children throughout the meal about eating when they are hungry and stopping when they are full within the mealtime. We also recommend talking about how food gives us energy and the nutrients that are in food to help us grow. When you’re ready to have children eat meals with the family, recognize that it will take them time to adjust to the food. Children’s taste buds are still developing and it is very important that you have reasonable expectations. Most people develop their likes and dislikes in childhood but then begin to branch out more in college and well into adulthood. Many people will have strong dislikes even as adults. It takes people about 10 times of trying something before knowing if they like it. We recommend preparing meals with at least one thing you know your child will eat. So if you are having soup as a family, perhaps they will at least eat bread or crackers. Do not add anything else to the table other members of the family aren’t eating. If you are having a meal with rice and sauce, ask them if they want their sauce on top of the rice or on the side. Keep trying! Often families get discouraged and play into children’s food preferences, ie. making only green beans as the side vegetable because it’s the only thing they will eat. Make your dinner as you normally would, while making sure there is at least one thing they like and serve them a very small portion of each thing. Serve children small portions so you can say yes. Serve about 2 tablespoons of each choice on the table. When you serve small portions you help to keep it simple for children because a big serving of food is overwhelming. Children’s stomachs are only about the size of their fist. Small portions give children the control to ask for more and an opportunity for you to say YES! Do not force your child to try anything on their plate. If they do not wish to try it, they can simply leave it on the plate. Try not to play into requests to not have it, not eat, or have something else. The goal is for children to try different foods. If they don’t feel like eating it, then leave it on the plate. If they don’t feel like eating, they can sit with you and talk about their day. Hold Clear Boundaries – “This is your last chance to eat until dinner. You could have a granola bar or a cheese stick, would you like to eat or wait for dinner?